In January 1941, the Radio Intelligence Division of the Federal Communications Commission picked up the signals from an unauthorized radio inside an apartment building in the Bronx. The FBI was notified and the G-men were on the case. They started investigating stores that sold parts that could be used to build shortwave radios. They found a store in Manhattan whose owner thought that a certain customer had been acting nervous and paranoid. That man was Joseph Klein and he was a German American. He shared his apartment with two other men, one of whom had been a German officer and the other that was a Russian. Both men had become citizens. But their loyalties were not with America. The former officer had been called to Germany and trained as a radio operator and sent back to America as a sleeper. The Russian had been trained in Germany in the sending and receiving of coded messages by radio. The G-men were able to pick up the radio messages sent by the spies, but they could not figure out the code. The Nazis used published books to design their code. In order to crack the code, the G-men would need to find out what book was being used. They had seen one of the spies pick up a book at a Yorkville store, but they did not see the title. The store stamped the inside of its books, so if they could enter the apartment and find the Yorkville book, they would have their code breaker. The G-men's hands were tied. It was illegal for them to enter the apartment without a warrant and a warrant would tip their hands, so they enlisted the services of an unlikely person: a cleaning lady. The woman was very excited to help, but she also was scared because if she was caught, she might be killed. She called the G-men a few days later and told them that she found only one book in the apartment that was stamped by the Yorkville store. It proved to be the key to the code. The G-men continued to collect and decode messages and foiled the Nazi spy ring. The fact that they did it with the help of a cleaning lady is odd! On this day, December 31st, in 1907, the first ball is dropped to welcome in the year 1908 at Times Square in New York City. Times Square had been the site of New Year’s Eve celebrations since 1904. After the city banned the fireworks display in Times Square, the owner of The New York Times, Alfred Ochs, arranged to have a large illuminated seven-hundred-pound iron and wood ball lowered from the tower flagpole precisely at midnight to signal the end of 1907 and the beginning of 1908. The ball descended 141 feet (43 m) in 60 seconds down a specially designed flagpole, beginning at 11:59 p.m. ET, and resting at midnight to signal the start of the new year. In 1942 and 1943, the glowing Ball was temporarily retired due to the wartime "dimout" of lights in New York City. The crowds who still gathered in Times Square in those years greeted the New Year with a minute of silence followed by chimes ringing out from sound trucks parked at the base of the Times Tower. The current version of the ball features a computerized LED lighting system and an outer surface consisting of triangle-shaped crystal panels. Thanks to satellite technology, a worldwide audience estimated at over one billion people watches the ceremony each year. The lowering of the Ball has become the world's symbolic welcome to the New Year. We wish all of the listeners to History Goes Bump a very happy and healthy New Year! We were joined on the episode today by Bill Clayton. Bill Clayton is a writer from Ann Arbor, Michigan. He's been writing professionally for more than 30 years. He has been the editor for the Michigan Engineer, the magazine published by the University of Michigan College of Engineering. He also writes and edits content for the College of Engineering Web site. He also regularly contributes to a number of magazines and writes about various topics, many dealing with science and he has interviewed celebrities, CEOs and average Joes, but what got our attention is his writing on the ghosts and urban legends of Detroit. The term asylum brings about many images and most of them are not pleasant. Particularly the asylums of years ago. Today, we know more about mental illness and have better plans for caring for people, but in the past, mentally ill people were treated as cast offs and it was permissable to do horrid things to these people. 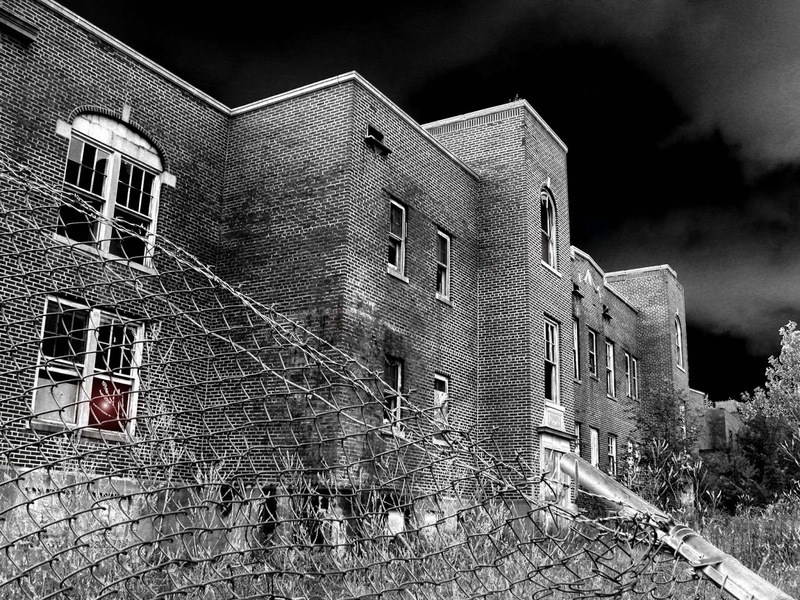 One of the most notorious asylums in America was Eloise Asylum. Conditions were overcrowded and care was subpar at times. 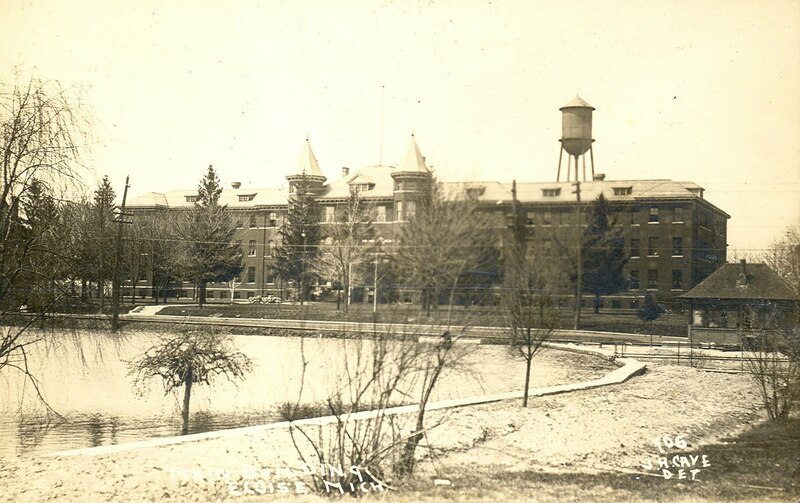 The asylum grew from the origins of a poorhouse to a schoolhouse and post office to a series of buildings built over the years to house the large amount of sick and mentally ill people brought here. Eloise is reputed to be one of the most haunted locations in the Detroit area for good reason. There is also a cemetery nearby named Butler Cemetery that has a reputation for being haunted. Join us as we explore the history and hauntings of the Eloise Asylum. "By the time I was in my teenage 'I want to be scared' stage, there were only three dilapidated buildings left standing on the hospital side of Michigan Ave. The piggery, cannery and the train depot were left on the farm side of the avenue. My friends and I were very taken with the buildings and had toured them many a late night. We always contained a sense of well being upon entering and though we had seen many cops patrolling the area, they had never seen us and were never caught. Upon entering the first of the many steel doors in the back area of the Old Hospital building itself you could either go directly downstairs or directly up. We chose to go down first. In the ruined basement our flashlights played upon five-foot tall metal crib-like enclosures and a metal straight-backed chair with leather straps on the armrests and legs. Turning and immediate right you faced the morgue, complete with pull out drawers and metal table with leather padding. One other room in the basement we found disturbing; we were never sure what it would have been called. The room was about 8 by 6 and along the left side there was a cell with a swinging door leaving just enough room to walk. Contained in the cell was a metal cot bolted to the wall and a place where the toilet had once been. When the cell door suddenly slammed behind me as I searched I quickly ran out." Government employees have seen apparitions. One woman claims to have seen a brown haired woman in a window several times. Lights are turned off and on. Disembodied growls and moans are heard. Channel 4 in Detroit joined the Michigan Ghost Hunters Society on a ghost hunt and before it even got dark, they captured an entity in a window. The elevator was uncooperative as if something else were controlling it. Strange orbs of light were captured. Different colors and different sizes. Her family ten thousand strong. Hand clipped, lest it grow too long. For that, my friend, was two decades ago. The carnival, when summer came 'round. Group laughter is such a sweet sound. For that, my friends, was two decades ago. Where the bread was far better than all. Were there, if you wanted to call. Back when we first met? The doom that decay begets. For I wrote this my friend, but two days ago." So perhaps the time spent at Eloise Asylum was not always unpleasant. Maybe some former residents find it hard to leave. Have the bad experiences of some patients led to negative energy and hauntings on the property? Bodies have been disturbed and built over. Has this caused spirits to be at unrest? Is the Eloise Asylum haunted? That is for you to decide! The Milwaukee Press Club has a very unusual mascot. The Milwaukee Press Club was established in 1885 and is considered the oldest continuously operating press club in America. So it would be only fitting that their mascot would be old as well. But mummified? The club's mascot is a mummified cat named Anubis. He is one hundred years old and sits encased in glass above the bar at the club's headquarter, which is named the Newsroom Pub. Until 1950, no one knew where Anubis had come from. It was that year that President Woodrow Wilson's former personal secretary and Washington correspondent Tom Brahany confessed that as a student journalist, he helped to steal the mummified cat. It had been originally in the possession of the Wisconsin Historical Society and then passed on to the cheif game and fish warden. Newsman Charlie Lush wanted to borrow the cat to display at a cat show, but the warden said that wasn't possible since the cat was state property. But he also added that if the cat disappeared after hours, there wasn't much he could do. So Lush got Brahany to help him steal the cat. And it was never returned. Instead, it ended up at the press club and they cleaned it up and named it Anubis. It was a good move for Anubis. He would have been forgotten at the historical society, but he has instead been glorified by poets, orators and statesmen and is enshrined in the hearts of scholars and savants. Anubis appears to be well loved. But his position as a mascot for a press club is certainly odd! On this day, December 27th, in 1932, Radio City Music Hall opens. John D. Rockefeller, Jr. held a $91 million, 24-year lease on a piece of midtown Manhattan property properly known as "the speakeasy belt." Plans to gentrify the neighborhood by building a new Metropolitan Opera House on the site were dashed by the failing economy and the business outlook was dim. Nevertheless, Rockefeller decided to build an entire complex of buildings on the property-buildings so superior that they would attract commercial tenants even in a depressed city flooded with vacant rental space. Radio City Music Hall was to be a palace for the people. A place of beauty offering high-quality entertainment at prices ordinary people could afford. It was intended to entertain and amuse, but also to elevate and inspire. The shimmering gold stage curtain is the largest in the world. Audiences have thrilled to the sound of the "Mighty Wurlitzer" organ, which was built especially for the theatre. Its pipes, which range in size from a few inches to 32 feet, are housed in eleven separate rooms. The Hall contains more than 25,000 lights and features four-color stage lighting. Original mechanisms still in use today make it possible to send up fountains of water and bring down torrents of rain. Fog and clouds are created by a mechanical system that draws steam directly from a Con Edison generating plant nearby. More than 300 million people have come to the Music Hall to enjoy stage shows, movies, concerts and special events. The historic Magnolia Hotel is located in Seguin, Texas. Its history includes use as a fort and was built by a man rooted in Texas history as a colonist. The property has existed for 150 years and passed through the hands of many owners and is currently under restoration. Its current state is nothing like the grand hotel it had been once upon a time. Hotels tell many stories and this one has stories that include murder and prostitution. Spirits are at unrest here. Join us as we explore the history and hauntings of the Magnolia Hotel. Seguin, (Segeen) Texas has a small town feel with streets lined by Queen Anne style homes and trees. It is east of San Antonio and is one of the oldest towns in Texas. Frontier rangers settled in the area in 1838 and named it Seguin after Colonel Juan N. Seguin who was a Tejano that fought against the dictator Santa Anna with his Anglo counterparts. German immigrants arrived in the 1840s. It was at this same time that Seguin became a stagecoach stop and the place where this stop was located was the Magnolia Hotel. The original Magnolia Hotel was a two room log cabin that was built by James Campbell in 1840 and used as a fort. Campbell was an original DeWitt Colonist. The DeWitt Colony was one of the main colonies that helped to settle Texas. It was named for Green DeWitt who had petitioned the Mexican government to set up a parcel of land for hundreds of Catholic families and many Mexican nationals. After a couple of attempts, the petition was agreed to and the area was surveyed and a capitol was chosen. In 1826, the colony was attacked by Indians on a horse raid and the capital was moved. Despite being the second most successful Anglo-American settlement in Texas, the colony soon faltered when DeWitt was unable to get enough families to come. The colony later became a county. Not much is known of Campbell's part in the colony other than he was with it early on. Campbell went on to become a Texas Ranger and fought as a Confederate soldier in Company D of the 4th Texas Regiment in John Bell Hood's famous brigade. He also co-founded Seguin as one of the thirty-three signers of the charter that established the town in 1838. In 1844, Joseph Johnson bought the property and added a concrete building to the back. The log cabin was converted to a stagecoach stop and the concrete building was opened as a hotel. An interesting note about Seguin is this use of concrete as a building material. It was unique and before long, Seguin had the largest concentration of concrete buildings in the country and some would even say the world. The type of concrete used was called limecrete and it was developed by John Park who was a chemist and inventor who moved to Seguin in the early 1840s. He built the hotel addition that became the Magnolia Hotel. It is the oldest concrete building in town. A bell was rung every time a stagecoach came to the stop and it is believed that the bell originally came from the Alamo. It was found in the San Antonio River in 1845. By 1847 Jeremiah Calvert owned the hotel and his daughter married the nephew of President Andrew Jackson in the hotel that year. Calvert sold the property to Dr. William Reid in 1850 and he ran the hotel for ten years. In 1853, the log cabin was replaced by a two story frame wood building. It was built in the Greek Revival style. Thomas Dickey Johnson took over in 1860 and he held the property until 1900. That same year, the stagecoach arrival bell stopped being rung and it was donated to the Daughters of the Republic of Texas. During the time that the hotel was a stagecoach stop, it had been the center of the town. The stagecoaches not only brought people, but it brought the mail and newspapers and other goods. So it was sad to see that come to an end. The hotel also fell out of its premiere position as the hotel to stay at in the early 1900s when other hotels were built that advertised that they were fireproof while the Magnolia was not. The hotel passed through several hands until the 1930s when the Lannom family acquired the property. The family decided to use the first floor as their residence and they rented out the second floor as apartments. They did this for sixty-five years. Then the building fell into disrepair. During that time, since the hotel was empty, it became a haven for homeless people and drug users. Erin O. Wallace, author of Haunted New Braunfels, purchased the hotel in 2013 and has been working to restore the property. Two rooms have been finished and an old porcelain sign found in the building hangs outside the door. And based on pictures taken by Rhonda, it would appear that the entire outside has been repainted. The original stagecoach bell also hangs outside the property with a sign describing its use. The Magnolia Hotel has a reputation for being haunted and there are several reasons why this may be the case. Wilhelm Faust, who was commonly known as William, had grown tired of his wife. He had actually become interested in her sister. He decided that the best way to end his marriage would be to murder his wife and he chose one of the favorite weapons of choice in the 1870s: an axe. It was 1874 and he had traveled to Seguin and was staying at the Magnolia Hotel on business. His wife hated staying alone, so she stayed with some friends in New Braunfels. This was a typical routine and William knew it well. He knew that his wife would be staying in the friends' daughter's room and that she would be sleeping on the floor. In the middle of the night, he stole a horse from the Magnolia Hotel and rode to the friends' house. He broke into the house and swung the axe at the body on the floor. He had made a terrible mistake though. The daughter Emma had switched places with his wife and she was the one on the floor. His wife was in the bed. So he swung the axe at the bed. As he went for another swing, Emma's brother came into the room and scared William away. His wife had not been killed by the attack, but he did blind her. William was caught and sent to prison for life. He was shot and killed while in jail in 1876. William is not at rest and for some reason, he has chosen the Magnolia Hotel as his final resting place. People have reported strange smells in the room he had once occupied and a shadowy figure has been seen in the window of the room. Emma has joined him, many claim. Is it because she is tied to her murderer somehow in the afterlife? Or is this young girl that reportedly haunts the hotel, someone else? This little girl ghost roams the hallways. Could the limecrete that part of the building is constructed from be a conduit for supernatural activity just as limestone can be? An English man who had been a traveling salesman was staying at the hotel and he committed suicide by cutting his own throat. Amelia was a young child who passed away in her sleep. Both of these rooms are upstairs and it is believed the spirits of these two people haunt the upstairs. Lights have been caught on video flickering and turning off and on. Another room upstairs seems to harbor a malevolent spirit. People are very uncomfortable in the room and have felt pressure tighten around their throats. The basement is creepy and has spirits at unrest. There are various noises that are heard down there that seem to be more than just shifting ground or other natural sounds. Ms. Idella was a fortune teller who lived at the hotel and is one of the more famous haunts here. Several orphaned children died at the hotel and seem to have never left and a young woman who was waiting for her beau to show up on a stagecoach died from a broken heart when he never did arrive. Willy was a young woman who took her own life and the life of her child. The list of deaths is extensive at this property, leading to an extensive list of ghosts here and makes us wonder why there seem to be so many at this location. Many figures have been photographed in pictures. Strange mists have been picked up on digital pictures as well. The owners reported just last week that, "Seems the second floor of the Magnolia Hotel was rather active yesterday for our A/C and electrical contractors! The antique pictures that are sitting on the mantel kept flying off whenever the contractors entered the room. They would place them back only to discover they were once again tossed off. After these several incidents they refused to be alone upstairs BUT thankfully they did finish the job." The Magnolia Hotel has a long and rich history and has been the scene of tragedy. Has this led to the house having supernatural activity? Is the Magnolia Hotel haunted? That is for you to decide! On this year's Christmas Special, we are joined by special guest Dan Foytik of the 9th Story Podcast, The Wicked Library and The Lift. We discuss some of the history behind Christmas and most importantly, analyze the history of telling ghost stories on Christmas Eve. Most of our Christmas traditions are rooted in Victorian England. Sending Christmas cards and caroling door to door are just a couple of those traditions, but one tradition fell by the wayside and that is the practice of telling ghost stories on Christmas Eve. 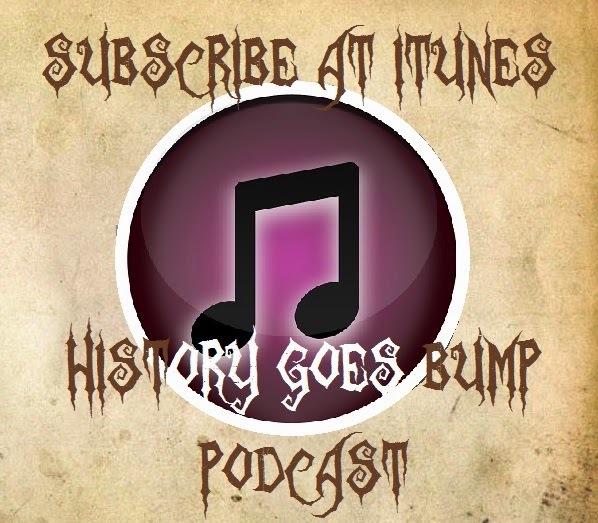 We are keeping that alive on the History Goes Bump Podcast and The 9th Story Podcast. We told ghost stories last year and we are doing it again this year. Mark Nixon of http://shadowsatthedoor.com joins us to tell one of his own original stories as well! Henry James wrote in his novel The Turning of the Screw, "The story had held us, round the fire, sufficiently breathless, but except the obvious remark that it was gruesome, as, on Christmas Eve in an old house, a strange tale should essentially be, I remember no comment uttered till somebody happened to say that it was the only case he had met in which such a visitation had fallen on a child." British humorist Jerome K. Jerome wrote, “Whenever five or six English-speaking people meet round a fire on Christmas Eve, they start telling each other ghost stories. Nothing satisfies us on Christmas Eve, but to hear each other tell authentic anecdotes about specters.” But where did this tradition originate? 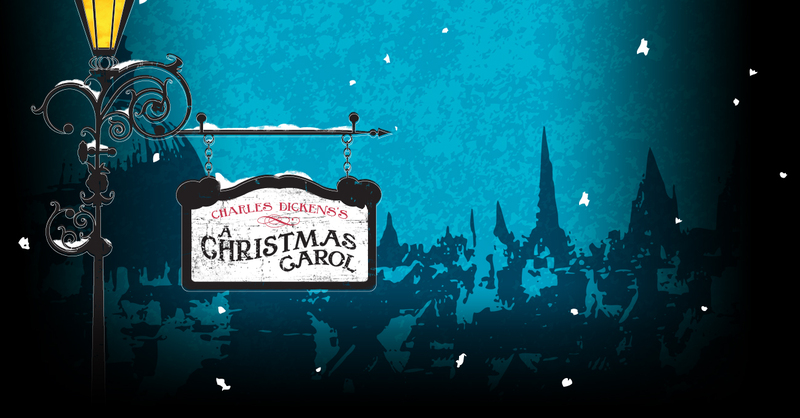 Many scholars claim that Charles Dickens inspired the practice by writing A Christmas Carol. During the Victorian era, Spiritualism was very popular and famous writers from that time all took a turn at writing ghost stories including Rudyard Kipling, Sir Arthur Conan Doyle, Elizabeth Gaskell and Edith Nesbit. But the tradition reaches further back then that because Washington Irving was writing about ghost stories being told on Christmas long before Dickens wrote his famous novel. And let's consider the origins of many of our Christmas traditions. They date back to Celtic times, the Roman Saturnalia and the Germanic Yule. Yule was a religious festival that entailed lighting the Yule Log, feasting on the Yule Goat and Boar and singing of songs with dancing. Different groups observed it differently, but it usually lasted for twelve days. Some religions like Wicca still observe Yule. Saturnus was the god of seed and sowing and Saturnalia became the festival created to honor him. It officially was celebrated on December 17 and during the reign of Cicero it lasted seven days, running from December 17 to 23. Augustus didn’t want the courts to be closed so many days, so he limited the festival to three days. Caligula changed things again and extended it to five days. The practice soon moved back to a full week of celebration. The poet Catullus described Saturnalia as the “best of days.” It was a holy day in which sacrifices were made to Saturn and it was a time of celebration. Roles were reversed on this day so slaves became masters and masters became slaves. Masters would serve food to their slaves and slaves got to practice leisure. They could use that leisure for playing sports or gambling. Gifts were exchanged and usually were items like earthenware figurines or wax candles. In each home, someone was appointed Saturnalicius princeps, roughly, Lord of Misrule. One cannot ignore the obvious when it comes to Christmas Eve though and that is the time of year that this holiday falls during. The Winter Solstice is the shortest day of the year and winter is considered the darkest time of the year. If Halloween inspires ghostly tales because the veil is thin, then Christmas inspires scary tales because it is dark and night reigns. The death of the sun is thought to be observed at this time and while some maintain that Halloween is when the veil is thinnest, it really makes more sense that the longest night would be when the veil is thinnest. The reason why Marley is walking the Earth on Christmas Eve in A Christmas Carol is because the veil is thin. And at Christmas we celebrate family. It is the perfect time to remember those who are no longer with us anymore. We must also consider that winter stories referred to fantastical stories. Jim Moon of Hypnogoria is the guy I go to on this kind of stuff and he wrote, "Furthermore in his story, The Christmas Tree (1859), in a section often collected separately as Telling Winter Stories, ironically enough Mr Dickens himself gives us a clue to where we may discover how many Christmases ago the tradition truly stretches - 'There is probably a smell of roasted chesnuts and other good comfortable things all the time, for we are telling Winter Stories - Ghost Stories, or more shame for us - round the Christmas fire.' Now the important term in that above quote is Winter Stories, for this is no mere idly coined epithet but a specific phrase that has fallen into disuse and whose meaning has been forgotten. For a 'winter story' referred to a fantastical story and this term was in usage for centuries before Dickens. For example, a 17th century century philospher Joesph Glanvill, in his most famous work, the treatise on witchcraft (referenced by Poe in Ligeia and by HP Lovecraft in his Yule horror tale The Festival) Sadducismus Truimphatus (1681) had harsh words for those who dismissed the existence of unearthly powers as "meer Winter Tales, or Old Wives fables". Rewinding a little further back into the past, we discover this usage of the term was around in William Shakepeare's time. And this is why he titled his strange fable of magic and transformations, A Winter's Tale (1623)." As we continue to wind back the clock to the 16th century, we find plays mentioning winter stories as being stories that speak of spirits. So telling stories near the Winter Solstice is a century olds practice. And somehow it has disappeared in our modern era. Why? Did the church manage to wipe the practice out as it absorbed other pagan customs of the time? Why would it hold onto decorating trees and such, but get rid of spooky stories? Or was it something else? Isn't it time that we return to building fires, lighting some candles, filling our mugs with coffee, tea, cider or hot chocolate and gathering to tell and hear scary ghost stories? Margorie McCall was an Irish woman who died from fever in 1705. As was the custom of the time, she was buried quickly to prevent the spread of the fever that had killed her. Margorie wore a very expensive ring on her finger and due to swelling it was not removed, so she was buried with the ring. Grave robbers heard about the story and decided to unearth her and steal the ring. The evening after she was buried, a couple of grave robbers disinterred Margorie. They had trouble getting the ring off, so they decided it would be best to just cut off the finger that held the ring. Imagine their shock when Margorie let out a shriek of pain. We imagine they might have dropped dead on the spot from fear. Margorie climbed out of her coffin, quite disoriented and bleeding from her hand. She went home. Her husband opened the door when he heard the familiar knock and discovered his wife standing there in her burial clothes, with blood dripping from her hand. He dropped dead from the shock. He was buried in the very grave that Margorie had just vacated. Margorie eventually remarried and had more children. She lived a long life and when she did eventually die she was buried in the same cemetery where she had been buried in the past. Her tombstone reads, "Lived once, buried twice." Now that certainly is odd! On this day December 23rd in 1823, a poem titled "A Visit from St. Nicholas" was first published anonymously in the Troy, New York, Sentinel. The poem begins with the first line "Twas the Night Before Christmas" and that is how it is more commonly known. The poem made its way into publication in the Sentinel via a friend of the author, Clement Clarke Moore. Moore was a professor who had originally written the verse for his children, but did not want to acknowledge writing the poem thinking it would make him look less scholarly. Moore himself acknowledged authorship later when he included it in his own book of poems in 1844 at the insistence of his children. The poem is credited with birthing some of the conceptions of Santa Claus from the mid-nineteenth century to today. Charles Dickens is the author of many classical novels, but probably his most beloved work is "A Christmas Carol." Christmas would not be Christmas without the tale it would seem in our modern era. Many of us probably never questioned as children why it was that ghosts were sent to teach the angry and obtuse Scrooge the life lessons he must learn. But why did Dickens choose ghosts? Did the idea of telling scary ghost stories originate with him? Join us as we explore the life of Charles Dickens and dive into his beloved classic, "A Christmas Carol, which is obviously quite haunted. On February 7, 1812, Charles John Huffam Dickens was born to John Dickens and Elizabeth Barrow in Portsmouth, England. Dickens was the second of eight children. John Dickens was a naval clerk and Elizabeth Barrow had aspired to be a teacher and school director. Dickens parents tried to make sure the family had everything they needed; however, the family was considered poor at best. In 1816, the family relocated to Chatham and in 1822 the family moved to Camden. At this point, the family's financial situation was dire and in 1824 Dickens father went to debtors prison. Dickens was just 12 years old at the time. With his father in prison, Dickens dropped out of school and got a job at a boot-blacking factory on the River Thames to help support his family. He earned a wage of 6 shillings a week. Later in his life, Dickens saw the moment he had to drop out of school to get a job as the moment he lost his "youthful innocence". Dickens later admitted to feeling betrayed and abandoned by the adults who should have been taking care of him. Looking at the themes of his work, one can see a re-occurrence of these themes. Dickens was able to go back to school once his father received an inheritance to pay off the debts. Dickens dropped out of school again when he was 15 years old to help with the family income. This next job was considered the launching point of his literary career. He was working as an office boy. Within a year, Dickens was doing freelance work to report on the courts in London and a few years later he was doing work for two major newspapers in London. In 1836, under the pseudonym "Boz," Dickens began submitting sketches to magazines and newspapers in London. In 1833, the sketches and clippings from the newspapers were published in Dickens first book called "Sketches by Boz." With all of this success it caught the eye of Catherine Hogarth and they were married soon after. Dickens and Hogarth had a brood of 10 children, but unfortunately they were separated in 1858. Around the time that "Sketches by Boz" was published, Oliver Twist was published. Dickens was inspired to write Oliver Twist because of the life he had lived as a child. The book was received well in both England and America. On December 19, 1843, A Christmas Carol was published. It has remained popular and has been adapted into movies, operas, and musicals over the years. While the phrase "Merry Christmas" was not new, it was made popular with it having been used in the novella. The novella also introduced the usage of the phrases "Scrooge" and "Bah Humbug." Dickens was fighting with his publisher so he financed the publishing of the book and ordered gilt edging, lavish binding and hand-colored illustrations. Despite these expensive upgrades, he priced the book at 5 shillings, so that everyone could afford it. Profits were low, but sales were high. Six thousand copies were sold in its first few days of release. In 1842, Dickens embarked on his first tour of the United States. At first, it seemed that Dickens enjoyed the fame, but eventually he began to resent the invasion of his privacy. From 1849 to 1850, Dickens worked on "David Copperfield." David Copperfield is not one of Dickens' most well liked novels; however, it is one of Dickens favorite novels. "David Copperfield" was the first novel of its kind and featured a main character that is followed through his daily life. In 1865, Dickens was in a train accident that he never fully recovered from. Despite this fact, Dickens still continued to tour the countryside until 1870. On June 9, 1870 at Gill's Head Place, Charles Dickens suffered a stroke and died at age 58. This was his country home in Kent, England. Dickens is buried at Poet's Corner at Westminster Abbey. At the time of his death, his last novel "The Mystery of Edwin Drood" was left unfinished. There are no stories of Charles Dickens' spirit making appearances. He has been used as an inspiration behind ghost tours in Boston around the holiday season. And it would make sense to use the author and his novel "A Christmas Carol," not only because of the holiday theming, but because of the main role that ghosts take in the novel. Christmas had been on the brink of extinction due to the zeal of the Puritans and many credit Dickens and A Christmas Carol along with several other works by different authors for saving Christmas. A Christmas Carol reminded people of traditions that had been important to them in the past. Included in this was the tradition during the Victorian Era of telling ghost stories during the Christmas season. On our Christmas Special we discuss with Dan Foytik the origins of ghost stories being told during the Christmas season. We trace this practice back much further than the Victorian Era, but it was at this time period that it became most popular. Dickens edited journals that specialized in ghost stories and while he didn't profess to believe in ghosts, he knew that people were very keen on them. So it made sense that his story of redemption at Christmas would contain the supernatural element of ghosts. First up was Jacob Marley and this is the only spirit that we know to be that from a human. Marley was Scrooge's former partner and he had been dead seven years. He makes a visitation to warn Scrooge that being a jerk will lead him to a tough afterlife. Marley is shrouded in chains and padlocks. And we are told he is transparent. So we have your garden variety ghost here. Recognizable and immaterial. The mood of the novel is perfect for ghosts. The fog is dense to the point that the houses across the street are referred to as "phantoms." When Marley leaves, Scrooge looks outside to see if he can see where he has gone and Scrooge thinks the air appears to be filled with phantoms. He recognizes many of them. The vision seems very personal for him. And it makes us wonder if this is what Hell really is. The Ghost of Christmas Past is a spirit that seems to be made for this specific purpose and carries an androgynous appearance. It wears a white robe and seems to be material and yet can change its appearance. It has the power to fly Scrooge around and replays his past, so we have something truly supernatural happening here. Something similar to a time slip, which we have surmised is a possible reason for ghost experiences. Scrooge extinguishes the ghost in anger and he finds himself back in his bedroom and no time has passed. The Ghost of Christmas Present is quite human in appearance, but he is a giant. He reveals that he can change his size to whatever he wants. He comes with a great feast and wears a green robe. This ghost too is able to transport Scrooge around the city and shows him how people are observing Christmas and warns him using the images of two children named Ignorance and Want. He disappears at the stroke of midnight, just as the final ghost comes onto the scene. The Ghost of Christmas Future is terrifying. To us, he appears as a demon. He rides in like a fog and materializes as a faceless entity draped in a robe. He says nothing, which makes him even more ominous. This entity gives a future premonition of Scrooge's death. It brings gloom and doom with it. It would almost seem that Scrooge was asleep, so did this ghost actually visit in the dream state. We hear similar stories about sleep paralysis. These experiences are terrifying as well. This ghost disappears as Scrooge awakens. This final experience is enough to change Scrooge. 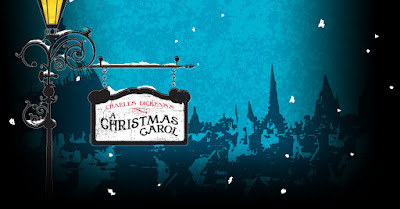 The use of ghosts not only is creative and perfect for the Christmas season, but it gave Dickens the ability to do anything supernatural that he wanted to with this novella. Time is very interesting in "A Christmas Carol." The ghosts explain that they have allotted times and they transverse time. We hear bells chime the time. We come to believe that anything is possible with the supernatural. Dickens really ushered in a new genre and helped solidify the idea that short stories and novellas are perfect for ghost stories. Do you believe that ghosts can visit us and change the course of our lives? That is for you to decide! White Bluff is a small town with a big legend. In a a famous hollow in this town dwells an entity that has come to be known as the White Screamer. Where this entity originates, no one knows for sure, but it has been seen by many people. The White Screamer appears as a white misty form that wails and screams, which is where it got its name. The screams are enough to drive people insane. The Screamer leaves evidence that it has been in an area by burning the grass and vegetation in the spot where it has ventured. One story around the legend dates back to the 1920s. A young man had built his growing family a home and a farm down in the hollow. Their happiness and peace was broken as each evening they would be awakened by these awful screams and crying. The young man had finally had enough and he grabbed a shotgun as he went out to investigate whatever beast was making this awful noise. He climbed to the top of a hill to see if he could spot the creature. The screams started again, but at a distance and he thought he recognized the voices of his wife and seven children. He climbed down the hill and ran back to his house, but he was too late. He opened the door and found his whole family dead and it was a horrible scene. Their bodies had been ripped apart and pieces of them had been thrown all over the floor. To this day, one can still drive by the hollow and see the foundation of the house and graves of the family members. A white misty creature that is capable of killing is not only terrifying, but odd. On this day, December 19th, in 1777, General George Washington led 11,000 of his troops into Valley Forge, PA to camp for the winter. At this point, the British has successfully taken Philadelphia and many doubted Washington as a leader. Washington led the men to Valley Forge to rest up and prepare for their next advance once the winter had passed. He had hoped to get fresh supplies, uniforms and foodstuffs before the winter was over, but Congress failed to provide these things to the troops. What followed was what many know as one of the harshest winters in US history. Without fresh boots, many of the men had to bind their frostbitten feet and they feasted on rice and vinegar for that Christmas. Washington wrote to Hamilton, that the men had experienced, "little less that famine" that winter. The war may have ended at Valley Forge, but Washington refused to back down. He made changes in his commanding crew, he upped punishment for those who tried to flee and won the adoration and respect of his men. Even though a plot had been put into place to replace him, the soldiers would not abandon Washington. With the plot foiled and the confidence of Congress behind him, Washington would bring his men out of a frozen hell, and make a push to begin the end of the Revolution. We would be remiss if we didn't mention that today also happens to be Steven's birthday and we are very proud to announce that he is now both our Assistant Producer and our Senior Research Assistant. Happy birthday Steven and thanks for all you do for us! Alton, Illinois is considered one of the most haunted small towns in America. The former Milton Schoolhouse is one of the reasons for this reputation. Many legends surround the school from murdered students to suicide to other deaths that lead people to claim that the currently bustling center of small business is haunted. There are others who believe that the school's reputation for hauntings is just that, a reputation. Join us as we explore the history and hauntings of the Milton Schoolhouse. Rufus Easton was born in 1774 and he came to be a successful politician, attorney and eventually a postmaster. Easton owned a ferry service which transported travelers across the Mississippi river. In 1818 he settled in a small river town in Illinois. He named this town after his son Alton. The area had originally been settled by the Illiniwek Native Americans. As time passed Alton, IL became a thriving town in shipping and industry. It sat at the convergence of the Mississippi, Missouri, and Illinois rivers and made trade easy in the area. It was officially incorporated as a city in 1837. Alton served as a major station for the Underground Railroad, the seat of the Catholic Diocese between 1857 and 1923, and was the hometown of Miles Davis, the famed jazz musician. It also has a dark spot on its history, as it is the birthplace of the now infamous assassin of Dr. Martin Luther King Jr., James Earl Ray. The reason Alton became so important for the Underground Railroad is because of its proximity to St. Louis. If an escaped slave could get across the Mississippi, he would be well on his way to freedom. Numerous homes had tunnel systems or hiding places in Alton. In 1904, the Milton Schoolhouse was built. The original parts of the school consisted of four classrooms, restrooms on the ground floor and a boiler room. Two new additions were made to the school in 1930 and 1937. This construction saw the addition of eighteen new classrooms, a gymnasium, and a cafeteria. The school served elementary students and was the main schoolhouse for Alton from 1904 until it was closed in 1986. New school buildings were built to operate within the school system and the Milton School sat abandoned for 4 years. In 1990, a man named Gary Levi purchased the building. A warehouse was added to the building in 1993 and he used it to operate Intaglio/Levay Glass and Giftware company out of. This decorative glass company was housed in the building until 1998. After the glass company was shut down the building sat dormant again, this time for eleven years. In 2009, it was purchased by Meredith Elston who now rents out space in the school to small local businesses. The school now houses a coffee shop, massage parlor, an aromatherapy store, three photography studios, a pet groomer, an electrician and a party bus company. Quite the odd assortment of businesses. 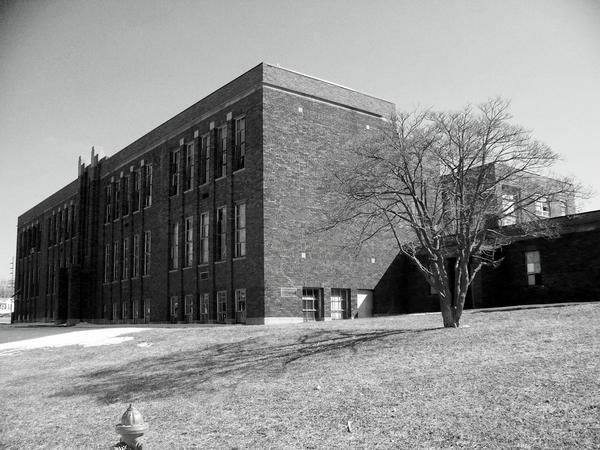 What is most commonly associated with the school building; however, is the hauntings. So much so that the official website for the business park now located in the school states that they like to think of the building as "just having character" and are trying to steer away from people seeing the schoolhouse as quote "and old urban legend." But there are plenty of odd occurrences to go around, most of them hard to ignore. Over the years, there have been reports of many kinds of activities in the schoolhouse. These vary and include footsteps, shadowy figures in a basement stairwell, a shadow seen peeking out of a second floor window, strange noises in the boiler room and other odd things. Patrick Keller mentioned on his podcast featuring this location that the cellar was very creepy. Exploding boilers killed many people. Did someone lose their life here? Or did something happen on the land? Ghost Hunters investigated the property. They experienced lights coming on and off by themselves and heard disembodied footsteps. They also heard a disembodied voice shush them. The most commonly reported occurrence of activity over the last 60 years revolves around the haunting of the school by a young girl named Mary and possibly also the spirit of the twisted man who would be her killer. Just a warning, the story that follows is disturbing and if you listen with young children, you may want to save this for later. According to legend, school had dismissed for the day on a fall afternoon. Everyone had gone home except for a girl who was working on a seasonal bulletin board for her class. Over the years, students and storytellers have given this girl the name Mary. When she finished working on the board, it had begun to get dark, as the days were now shorter, and she gathered her things and headed for the doors by the gymnasium. As she reached the doors, the story says there was a noise behind her which she turned to look at. Mary's body was discovered the next day in a shower stall in the locker rooms next to the gymnasium. The young girl was found with her clothes torn, bloody and bruised. She had also been violently raped. Bloody flesh was found underneath her fingernails and people were on the lookout for someone who had been scratched or cut. After a few days, it was noted that the school janitor had not shown up for work. Upon investigating, he and his mother claimed he had been sick with the flu for those days and could not attend work. They found scratches on both of his hands, which he claimed his cat had left, and with no evidence to arrest him, they left. A few days after this, the body of the janitor was found hanging in the school. Some have speculated that it was the pressure and harassment of the police which led him to take his life, but the legend says he was found with a note scrawled near him which simply stated "I did it". Though this seems like a pretty solid confession, the murder case was never solved. For years following this, children claimed to have encounters with strange figures, hear sounds all around the school and the name Mary floated through the halls like a secret word on the tips of everyone's tongue. When Intaglio Design took over the building, employees claimed to see the apparition of a small girl while working there. They claimed to find glass items shattered near a specific shower stall in the previous locker room. There was even one employee who claimed the apparition of the young girl became very attached to her. Her office was located by a stair well outside of the gymnasium. An apparition of a young girl was often seen in her office, out of the corner of her eye in other rooms, and was even reported to have typed on the computer when no one else could have possibly been in her office. Little X's and O's were left behind on the screen. This employee grew attached to the spirit of the little girl. Over the years, she claimed another spirit was in the school as well. This one, she said, was threatening. Other employees felt short of breath and panicked in the area surrounding the girls shower room and even supported the story that they had seen the office employee terrorized by a spirit in a hallway. The woman eventually left her job and refused to return to the building. A few years later, it was shut down again, until the purchase in 2009. The story of Mary seems to lack a lot of physical evidence and many chalk it up to an urban legend, but something seems to be causing activity at the school. Is this just another piece of folklore which has permeated the society in Alton, IL? Was the girl known as Mary really killed there and stays behind to wander the halls of her old elementary school? Is the Milton Schoolhouse haunted? That is for you to decide. It's tradition for some people during the holiday season to use an advent calendar to count down the days until Christmas. Perhaps as a child, you had one with boxes filled with chocolate treats or you opened a window to a fun picture. We noticed this year that some people are keeping a calendar of sorts wherein they drink a craft beer from an independent brewery. All sorts of fun flavors are combined to craft the perfect brew. But would you believe that there is one beer that is brewed with elephant dung? Sankt Gallen Brewery out of Japan created Un, Kono Kuro, a beer that is made from coffee beans that have passed through an elephant. We don't mean passed over or under, but through. Meaning the entire digestive process. The beans are well...harvested, from the steaming pile of elephant poop and rinsed off. We hope really well. The elephants that pass these beans live at Thailand's Golden Triangle Elephant Foundation and the cost is pretty high. It's $100 per 35 grams, which converts to .077 pounds. We're not sure if this fact is odd or just a twist of sick humor, but the beer is categorized as a chocolate stout even though it contains no chocolate. And while it may not sound appetizing, this brew flew off the shelves. The name Un, Kono Kuro is a pun on the word "unko," which means "crap" in Japanese. Many people claim that the stout is quite tasty and sweet, but we just find making beer from elephant poo rather odd! On this day, December 14th, in 1900, German born Physicist Max Planck published his ground breaking study on the effects of radiation on “blackbody” substances and the Quantum Theory of modern physics was born. Max Planck was born into a traditional, intellectual family. His great-grandfather, grandfather and father were all college professors. During his elementary and secondary education he studied astronomy and mechanics. He also was taught the principal of conservation of energy. He graduated early at the age of 17. Wanting to continue his education and study physics he enrolled at the University of Munich. Under the tutelage of Phillip von Jolly, a professor of physics, he began his studies. Jolly first advised him against going into physics saying, “In this field, almost everything is already discovered, and all that remains is to fill a few holes.” After graduating from the University of Munich with honors Plank became an educational lecturer. In 1894 he was commissioned by electric companies to create maximum light from light bulbs with minimum energy. This commission is what first turned his attention to the problem of blackbody radiation. Which in turn lead him to his discovery of Quantum Theory. He shocked the science world by showing that atoms emit or absorb energy in bundles, or quanta, not in continuous streams as taught by Newtonian physics. This insight along with subsequent developments by Einstein, Bohr, and others established the revolutionary quantum theory of modern physics. Buffalo Trace Distillery is the oldest continuously operating distillery in America. Herds of buffalo once thundered across this area of Kentucky where the distillery stands and they carved a path, which is called a trace. This particular trace is called the “Great Buffalo Trace” and it led to the banks of the Kentucky River and gave the distillery its name. Some of the finest Kentucky Bourbon is made here. But there are more than just the drinkable spirits at this location. The kind of spirits that lead to tales of ghosts can be found here as well. Join us as we explore the history and hauntings of the Buffalo Trace Distillery. Many explorers traveled through this area including the likes of Daniel Boone in 1771. These explorers were follow the traces left by the buffalo. A ford is a natural area in water that is shallow enough to easily cross. One such ford on the Kentucky River was being used by European pioneers for making salt. Native Americans attacked the group there and killed a pioneer named Stephen Frank. After that, this crossing on the Kentucky River became known as Frank's Ford in honor of the slain man. Later the name would be changed to Frankfort and that city is now the capital of Kentucky. In 1786, James Wilkinson purchased 260 acres north of the Kentucky River and this became the heart of Frankfort. James Wilkinson served in the Continental Army during the Revolutionary War. One of his endeavors was serving under Nathanael Greene during the Siege of Boston. General Gates sent him to Congress with details on the Battle of Saratoga and he added his own tale of bravery when he finally showed up to Congress. It wasn't the truth, but they promoted him past many senior ranks who were furious. Wilkinson also joined with the Conway Cabal, which was a plot to replace George Washington as Commander-in-Chief with General Gates. Gates asked him to resign. Wilkinson was not done with controversy however. In 1787, he declared loyalty to the King of Spain while in New Orleans to improve his commercial enterprises in the state of Kentucky. He worked to get separation for Kentucky from Virginia as well. He would later help take possession of the Louisiana Purchase in 1803. But he was still working with Spain and at the time of his death he was found to be a paid spy for Spain. Theodore Roosevelt said of him, "In all our history, there is no more despicable character." Frankfort got its first post office in 1784 and Kentucky became an official state in 1792. Frankfort became the home to several bourbon distilleries. In 1773, the McAfee brothers surveyed the crossing at the Kentucky River and then in 1775, another set of brothers, Hancock and Willis Lee, founded a settlement and called it Lee’s Town. As the settlement grew, many found the “abundant limestone spring water, and fertile bottom loam” was perfect for growing outstanding grain. This led to the start of distillation, and the start of the Kentucky bourbon heritage. A shipping port cropped up here as well for hemp, tobacco and whiskey. Hancock and Willis Lee started a distillery where the Buffalo Trace Distillery now stands when they founded Lee's Town. To this day, there is bourbon featuring the name Hancock in tribute to Hancock Lee. The Riverside House was built in 1792 on the property by Commodore Richard Taylor and it still stands there today. It is the oldest house in Franklin County. The first official distillery was built in 1812 by Harrison Blanton, but had no official name. 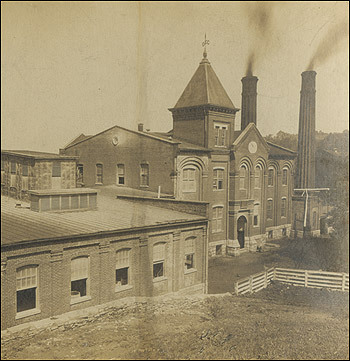 In 1870, Edmund H. Taylor bought the distillery and gave it the name Old Fire Copper, which was its first official name. Most people refer to it as the O.F.C. He used wood fire and copper stills to distill. He also built another distillery at a cost of $70,000, a small fortune at the time. He was the descendant of two presidents, James Madison and Zachary Taylor. In 1882, the O.F.C.burned to the ground after being struck by lightning and was quickly rebuilt. George T. Stagg bought the distillery eight years later. Stagg developed the first ever climate control for distilling whiskey by using steam heating in storage warehouses. He expanded the property too. Stagg was born in 1835 in Kentucky, but he moved to St. Louis to become a whiskey salesman. He later met up with Taylor and the two are considered icons in the distillery business. In 1904, the distillery became known as the George T. Stagg Distillery. It held that name for a century. In 1897, Albert B. Blanton joins the distillery as an office boy at the age of 16. He was a descendant of Harrison Blanton who first distilled whiskey here. He was promoted through the years and learned all facets of the business. In 1921, Blanton became President of the distillery. He would spend 55 years producing and promoting Kentucky straight bourbon whiskey. He kept the distillery alive during Prohibition and after a devastating flood in 1937, he had the operation up and going the very next day. 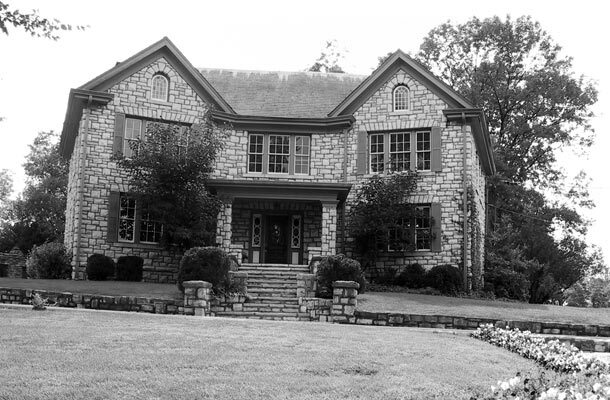 He built Stony Point Mansion on the grounds and it overlooks the distillery. The reason why the distillery remained in business during Prohibition was because Blanton managed to get one of four permits given out by the government allowing them to make whiskey for medicinal purposes. They bottled one million pints. A clubhouse and gardens were installed in 1934 adding to the beauty of the property. Blanton retired in 1952. Elmer T. Lee took over operations in 1968. In 1982, a New York investor group bought the distillery. Moving from family owned to investor group was not a good move and the distillery's employment dwindled to only 50 and by 1991 the distillery was on the verge of closing. The distillery returned to family ownership when the Sazerac Company bought it in 1992 and after refurbishment it was renamed the Buffalo Trace Distillery in 1999. In 2001, it was placed on the National Register of Historic Places. Distillery tours are given six days a week. Ghost tours are also given on the property and for good reason. When Ghost Hunters visited the distillery to do an investigation on the 125 acre property, every member of the team had an experience and they identified 27 different ghosts. The one encounter that got everyone’s attention was when the two main hosts were “goosed” or pinched on the back side. They were both in different areas and when they reported in, they both reported being pinched by something unseen. There have been stories that employees and visitors to the distillery catch the smell of cigar smoke and hear footsteps in places where there were no other people. Riverside House is a stark white building that is rumored to house numerous specters. Commodore Richard Taylor is one of them. He has been seen in an upstairs window. There is also an unidentified young boy at the house as well. There have been sightings of a gentleman wearing a dated suit and hat at the Stony Point Mansion and some think it is the ghost of Albert Blanton, who died in the mansion in 1959. During a Christmas lighting event on property, a guest took a picture of a building and the developed shot shows a ghostly figure standing in an upstairs window. Then a few months later, the tour guide tried all 9 keys available to try and unlock the mansion where Mr. Blanton had lived and died, and not one key worked that night, forcing the Ghost tour to be held in a parking lot. Blanton's housekeeper Sarah is heard humming in the mansion as well. And even in summer, icy chills are felt in the basement. Warehouse C stores spirits of both varieties. A wall was about to collapse one day and a cry was heard for everyone to get out. The workers ran out just in time. When they got outside they started asking each other who shouted the warning. None of them had and none had been aware that the wall was going to collapse.It would seem something unseen gave them a warning. The Buffalo Trace Distillery has a long and productive history in Frankfort Kentucky. Are there really more spirits at the distillery then just what is aging in the barrels? Are the legends of distillation still walking the grounds of the distillery? Is the Buffalo Trace Distillery haunted? That is for you to decide! A man was snorkeling in the Colorado River near the Arizona and California border. Most people when they go snorkeling expect to see some fish and cool underwater geography, but probably not skeletons. Especially skeletons sitting in lawn chairs at the bottom of the river bed, complete with sunglasses. The man was terrified by the sight and promptly reported it to the La Paz County Sheriff. The police assumed they had a couple of dead bodies on their hands, until they saw the skeletons. They realized they were fake. They had been strapped to the lawn chairs, which had been bound to large boulders. One of the skeletons held a sign inferring that he was Bernie from the Weekend at Bernie's movie. The police decided to not investigate who might have placed the skeletons in the water and they figured it was just a fun prank. The sheriff's office thought that perhaps they would recover the skeletons and put them outside the building for fun. We're not sure if they did, but a fake skeleton, underwater tea party certainly is odd! On this day, December 9th, in 1907, the American Lung Association Christmas Seals went on sale for the first time in the United States. During the early twentieth century tuberculosis was the leading cause of death in the U.S. In Sanatoriums doctors were finally experiencing some success treating patients. A tiny sanatorium on the Brandywine Creek in Delaware had fallen on hard times and if $300 could not be raised its doors would have to close. One of the doctors from this sanatorium explained the problem to his cousin, a volunteer named, Emily Bissel. Being a veteran fundraiser Bissel soon came up with a plan based on an idea that had worked in Denmark. In 1904 Einar Holboll, a Danish postal clerk developed the idea of adding an extra stamp on mailed holiday greetings during Christmas. The money raised from the sale of this extra stamp could be used to help sick children with tuberculosis. The success of this charitable stamp inspired Emily Bissel to design a stamp that could be sold for a penny each at the local post office in Delaware. The fundraiser was so successful that they ended up raising ten times the amount needed to keep the sanatorium open. 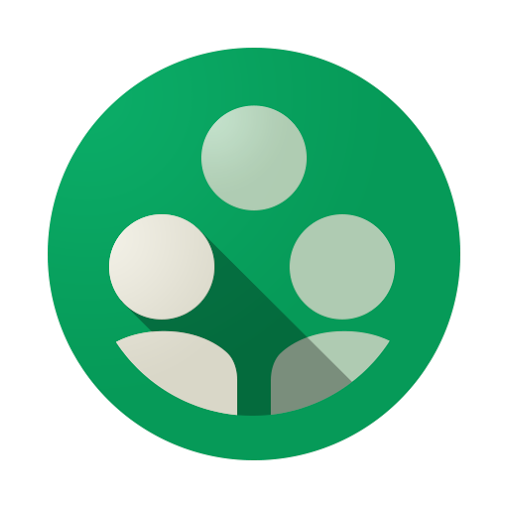 By 1908 Bissel’s idea grew to a national program. Through World War I, The Great Depression, and World War II the tradition continued. As the American Lung Association’s mission expanded to include research into other respiratory diseases, such as lung cancer, more people began to send Christmas Seals. In the 1960’s, 70’s, and 80’s the American lung Association stepped up to protect children and families from pollution and cigarette smoke, so did Americans with their continued support each year by supporting the Christmas Seals tradition. Today the American Lung Association still uses the sale of Christmas Seals to fund a majority of their research and programs. Many people mistakenly refer to the Homestead Sanatorium as an asylum, but it was never an asylum. Although abandoned and derelict, the building still stands grandiose and beautiful and it would be a shame to see it torn down. The benefactor of the property, Horace Carpentier would not want to see that happen either. For decades, those with TB called Homestead home and many of them died here. Is that why the place is rumored to be haunted? Or is it just because it is a large abandoned building with a history? Join us as we look at the history and hauntings of the Saratoga County Homestead Sanatorium. Horace W. Carpentier was born in 1824 near Barkersville, New York to James and Henrietta Carpentier. The family name had originally been Carpenter, but Horace's grandfather changed it to Carpentier. Their branch of the family tree was the only one to take on this spelling. The family lived in Galway, which was a part of Saratoga County. Horace attended Columbia Law School and graduated in 1848 with a degree in Law. That same year, gold nuggets were found in the Sacramento Valley in California. Soon, the California Gold Rush was on and men found themselves traveling across America or by boat around Cape Horn to find their riches. One of these men was Horace. He boarded the ship "Panama" to sail around the "Horn" and on August 8, 1849 he arrived in California. On the ship he met Andrew Moon and the two men fostered a successful business relationship in both law and real estate. Politics soon entered the picture and Horace decided to run for State Senator. He was unsuccessful, but he did not give up. He tried for State Superintendent of Public Instruction and again failed. What is a man to do in such circumstances? Well, go look for gold, of course! His fellow law partners, Andrew Moon and Edson Adams joined his efforts. Adams had already located some land that measured around 160 acres and laid claim to it by squatting on it in 1850. Horace and Moon claimed the same amount of acreage to the east and west of that property and that land would come to measure 200 city blocks. The area was incorporated as Contra Costa and we know it today as Oakland, California. Horace finally broke into politics in 1851 as a Senate Enrollment Clerk and the position allowed him to make several political connections. At the same time, Horace started a ferry service between Oakland and San Francisco. It flourished and he sold the operation to another man while holding onto the contract for twenty years and he soon became a rich man. He worked with his partners and other politicians to incorporate Oakland as an official town in 1852. He managed to get the rights to the entire waterfront and people went along with it because he promised to build a school and a wharf. The school was completed in July of 1852. There was a lot going on behind the scenes though and Horace was wielding his power and doing things that made him one of the most hated men around. But he also had a lot of fans because he could be very charming and he had become fluent in Spanish and claimed to be a former Padre. To make people feel better, Horace placed the waterfront property into the name of his cousin Harriet, although he continued to control much of what happened in the area. In 1854, despite not having the best reputation with the people, Horace was elected the first mayor of Oakland. Members of the city council decided to put a halt to Horace's monoploy on the waterfront and they passed a measure to build another wharf. Of course, the new mayor would not sign off on such a thing and a political war began. Horace would serve only two years. He turned his sights to the railroad and made a lot of money with that venture as well. He was worth up to $20 million at one time and gave much of his estate away before he died on January 31, 1918 at the age of 94. One part of his estate was his father's homestead and he deeded that to Saratoga County in hopes that a Tuberculosis Sanatorium would be built there. He also donated $5600 in 1915 to get a 20 bed facility built. He maintained the road outside the sanatorium, providing $1000 every year and he named the road after his Chinese butler because of his loyalty. His will left $40,000 to the sanatorium. 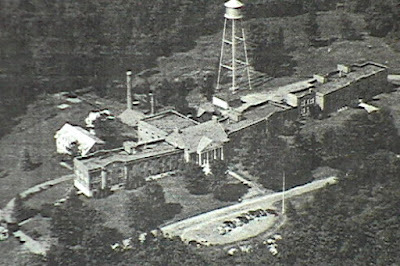 The Saratoga County Homestead Sanatorium officially opened in 1914. The first building was built from wood, but later replaced with the building that stands today. This main building was built in 1932 in the Classical architectural style with large columns lining the front entrance. Red brick and wood were the main building materials and based on photos we have seen in its dilapidated present condition, hallways were long with rooms coming off them and stairs were built from wood with fancy carved banisters. There were separate areas for girls and boys and these titles were carved in the concrete above the doorways. 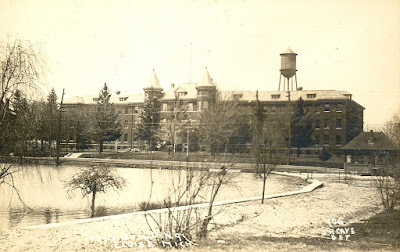 Some reference the hospital as an asylum, but it never housed the mentally ill. It's main purpose was to help patients with TB. It was believed the clean mountain air here would be good for the lungs. In 1960, the sanatorium closed because the need to treat TB was gone. It reopened in 1961 as the Saratoga County Infirmary, which was basically a public nursing home. This remained open until 1979. The building was sold in 1980 to Bruce Houran who had planned to open a treatment facility, but this was abandoned. Patrick Brereton bought the property from Shimon and Dervinowitz LLC for $60,000 in 2015. The property is fenced off and there is no trespassing. A caretaker lives next door. In January of 2012, a teenager named Noelle Johnson died in a traffic accident near the property of the sanatorium prompting officials to seal off the property. They believed that she was there along with other teenagers because they wanted to check out the "haunted hospital." There are rumors that if you take something from the building, like a book, that you will be cursed. Had this teenager taken something with her? Police are called on trespassers, but they generally will not enter the building. Is this out of fear of asbestos and other hazards or is there something else going on here. Something unexplained? "My sister and I came to visit saratoga a few years back and was looking for a place to play disc golf. But, we ended up getting turned around and stumbled upon this place. We thought it would be a good idea to jump the fence and take a peek inside to just get our thrills. When we went inside I was so glad it was during the day cause at night I would have just stayed outside. After about 20 mins inside we got s few pix and decided to get the hell out. But as I was driving down the road, we started to feel sick and have headaches like something was on or in us. It was a few minutes later that my sister pulled out a tile she took from the place... my superstitious thought was to return it immediately.. So my sis agreed. and we went back to return the tile. Once, the tile was returned, we both felt better and got the hell outta dodge." Let's deal with the rumors or what we like to call the urban legends. People tell a story about an evil doctor who liked to experiment on women, particularly on their reproductive organs. He ended up killing many of them and claiming they had died from TB. There are no records to back this up because supposedly they burned. I will say that it seems that are not many records for this location anywhere. Did this doctor actually exist? Who knows? A film called "The Expedition" is said to be based on true events when a Canadian film crew entered the Homestead Sanatorium on Halloween in 2004 to make a documentary. There were five of them, but by the time they left in the morning, there were only four of them. No one knows what happened to the fifth who was named Thomas Kring. We were unable to find any record of this and I would assume there would be some kind of news story or report somewhere. So is this true? We doubt it. Horace Carpentier was buried at the nearby Barkersville Cemetery and it is believed that he is one of the ghosts haunting the sanatorium. Children were rarely seen outside of the buildings, but they were here and there are claims of hearing the disembodied sound of children giggling and a girl apparition has been witnessed. People claim a heaviness inside the buildings and feel like the chapel holds some kind of evil entity. The website thefreegeorge.com claims this location to be one of the top haunted locations in Albany, but there is not much verifiable information about hauntings out there. Horace Carpentier cared about this place, so is it possible that he decided to stay in the afterlife? Is the Homestead Sanatorium haunted? That is for you to decide! Eleanor came to work at Murphy's Historic Hotel in the early 1860s when the hotel was known as the Sperry and Perry House. Eleanor worked there as a chambermaid. As happened with many young ladies during the Gold Rush, she found herself falling in love with a miner. She married him and he went off to find their fortune. And he never returned. Eleanor continued to work at the hotel as she waited and waited for him to return. Her duties expanded to working in the kitchen and running the front desk. She died thirty years later, never having her husband return to her. It was after her death that guests started to notice strange things happening in the hotel. Eleanor is seen as a full bodied apparition in the kitchen and occasionally small objects go flying without assistance in the kitchen. A maintenance man claims that coffee beans were thrown at him once in the kitchen when nobody was in there with him. Eleanor also plays with the locks. She tries to wiggle the Master Lock free and this can go on for hours. She also pushes open closed doors, especially upstairs in the Mark Twain ballroom during staff meetings. Some people claim to see her reflection in the mirror of the hutch in the Gold Room, an area off of the main dining room. A picture of Eleanor is nearby. Two guests staying in Room 9 got so spooked that they left the hotel and did not ask for their money back. "The winding hillside known as Prospector Road is considered one of the most haunted roads in the Gold Rush country. It's pavement runs over old mines, old claims, and the bodies that lived it's history. In some cases, the collapse of tunnels gave miners premature burials, some died as a result of being eliminated by other greedy miners. Prospector Road is in some places little more than a one lane path, as it runs the seven mile stretch adjacent to the convenient and more traveled county built Marshall Road. Prospector Road was built by Chinese labor in the 1800's, and cuts the winding mountainside connecting with Marshall at both Lotus and Garden Valley. The barely traveled road and surrounding terrain has a colorful Gold Rush history. It is well documented the treacherous nature of the countryside caused many a wagon, and later automobile, to overturn, spilling their passengers down the hillside to their painful date with death. In the 1800's, substantial gold discoveries were made in these hills, which account for its name. As with the age-old stories of prospecting and claim jumping, many a foolish miner who bragged a bit too openly about his "find" was coincidentally lost among the hills of Prospector. Their bodies were often never recovered, and more often never looked for. It is known that many spirits roam the Prospector hills, and at least one is still seeking the gold he never recovered while having his life cut short while trying. Perhaps it was his specter who frightened a young couple with poltergeist-like pranks after they settled in a new home along the road. It was late one night the pretty young bride awakened from her fretful slumber. She was cold and had a feeling of something amiss. She pulled the covers up. Then she remembered making a large log fire before retiring, one that should have kept the house warm till morning. She turned her head to see the reflection on the wall, observing the wood still burning in the stove. She was grateful for the mirror on the wall which made this possible from her second story bedroom. Then her imagination kicked in, and she thought she heard unnatural noises in the house, She carefully and gently woke her husband, who was not to thrilled to be getting out of bed to indulge her. Together they went down the stairs. "I knew my husband had locked and bolted the front door before we went to bed" she told us. "Now it was ajar. The bolt pin was still in the outward position, yet the wall slot where it should still be secured had not been torn." the couple could find no evidence of forced entry. The mystery of the unexplained open door went unanswered. Everything else appeared as it should. that is, except for their dog. Hearing a frightened whimper, they turned to find their pet huddled and trembling in a corner of the room. Consoling the animal, the husband opened the door and looked outside into the darkness. Nothing! He carefully went around the house. Nope! Thus the family was introduced to the ghost of Prospector Road. He is a wily old cuss. This apparition is described by residents as rugged, big, stocky and attired in old pants, or work like clothes. Sometimes he has a canvas looking rain coat pulled over his head. To those who are able to see him, he appears semi-transparent, tall and craggy. Some say he is sporting a beard. to those who cannot see him, but endure his wrath, he is considered a pesky, annoying trickster. "The legend goes, and most folks believe, his purpose is to keep people away from a claim he never received." You can continue reading this story and other stories about the Hauntings on Prospector Road and other Haunted Highways in "The Incredible World of Gold Rush Ghosts." True stories of Hauntings in the Mother Lode. Authored by Psychic Nancy Bradley. The Japanese call it the Ma-no Umi: the Sea of the Devil. Everybody else calls it the Dragon's Triangle. It is nearly opposite the Bermuda Triangle and often compared to it for good reason. It is the cause of many ships and planes mysteriously disappearing. Some believe that Amelia Earhart went missing because of the Dragon's Triangle. Other phenomenon have been linked to the area including ghost ships, USOs, lapses in time, and electronic equipment malfunctions. Some researchers claim that seismic events, volcanoes and other natural occurrences cause most of the "paranormal" activity within the Dragon's Triangle. It is true that the area is volcanically active and small islands seem to appear and disappear regularly, but does this really explain how ships and planes could just disappear or in most recent news reports, could this cause several large wooden ghost ships full of decaying bodies to wash up on Japanese shores? At least 12 wooden boats have been found in the Sea of Japan over the past two months carrying the decaying bodies of 22 people. The bodies were described as "partially skeletonized." One boat had only six skulls in it and another had two bodies without their heads. The bodies probably belong to people defecting from North Korea out of desperation and who could blame them. The ships are old and hard to steer. Could wandering through the Dragon's Triangle make things even worse? The triangle takes its name from the dragons that were believed to live in the area. And while these fire breathing dragons were probably volcanoes, who knows if dragons just might have dotting the landscape. No matter the explanation, the things that happen around the Dragon's Triangle certainly are odd! [Transcript] On this day, December 4th, in 1872, the Mary Celeste was found abandoned off the coast of Portugal. The British brig Dei Gratia had left New York shortly after the Mary Celeste and it was her crew that discovered the ghost ship. Captain David Morehouse sent a crew off to the ship to see if it needed assistance. The crew found no one aboard, but belongings were still inside the ship. The sails were still set. Six months worth of food was still on board. The only lifeboat was missing and there was three and a half feet of water in the bottom of the ship. The Mary Celeste had a crew of seven plus the Captain, his wife and their daughter. After a thorough investigation, no one could figure out why the crew would leave the ship. It had a working pump and the water in the ship was normal for a ship left afloat with no crew. The compass was damaged and the clock was not working, but this would not call for abandonment. A sextant and the ship's log and papers were missing, but something else was missing that struck investigators as very odd. The Mary Celeste had been hauling 1700 barrels of alcohol used to fortify wine. Nine of those barrels were empty. Where had the alcohol gone? The boarding party from the Dei Gratia sailed the Mary Celeste to Gibraltar to claim a reward. The reward was less than expected and might have been less because some suspected foul play on the part of Dei Gratia. The top theory as to what happened is that the alcohol barrels were empty because they had leaked causing intense fumes. The hatches were opened, but the Captain decided to have the crew and his family get into a lifeboat that they tied onto the ship to wait for the fumes to dissipate. Somehow the lifeboat floated away leaving those aboard at the mercy of the sea. Some time later, a boat full of horribly decomposed bodies washed up on shore in Spain. Was this the crew of the Mary Celeste? We'll never know. [Full research] On December 4, 1872 The Mary Celeste, an American merchant brigantine, was found adrift and abandon in the Atlantic Ocean near the Azores Islands, by the Canadian brigantine, Dei Gratia. She was disheveled and under partial sail but still seaworthy. No one was on board and the lifeboat was missing. The Mary Celeste was built in Canada in 1860 and was originally christened Amazon. During her first 10 years she encountered many accidents and went under repair. After her last repair she was renamed Mary Celeste. In 1870 J.H. Winchester purchased the Mary Celeste and she gave two years of good service. In 1872 Captain Benjamin Spooner Briggs purchased shares in the Mary Celeste and became her captain. The ship was then altered to accommodate the captain’s family so that they could sail with him. Captain Briggs, his wife Sarah and their 2 year old daughter Sophia and a crew of seven men set sail from New York to Genoa on November 5, 1872. The ship carried a cargo of 1701 barrels of poisonous denatured alcohol. Do to uncertain weather conditions Captain Briggs set anchor near Staten Island for two days. On November 7, 1872 the weather eased and the Mary Celeste left harbor and set sail in the Atlantic. On December 4, 1872 Captain David Morehouse of the Dei Gratia spotted the Mary Celeste about six miles away and headed unsteadily towards the Dei Gratia. The ships erratic movements and the set of her sails lead Captain Morehouse to suspect something was wrong. After not receiving an answer to his signals and not seeing anyone on deck of the Mary Celeste the captain sent first mate Oliver Deveau and second mate john Wright to investigate. Once Deveau and Wright boarded the Mary Celeste they discovered her completely deserted. The sails were still partly set but in poor condition, some were missing altogether, and much of the rigging was damaged with ropes hanging loosely over the sides. The main hatch cover was secure, but the fore and lazarette were open, their covers beside them on the deck. The ship’s single lifeboat, a small yawl, was missing, while the binnacle housing the ship’s compass had shifted and the glass broken. On deck a sounding rod ( a device used for measuring the amount of water in the hold) was found abandon. 3.5 feet of water was found in the hold. Although it is a significant amount of water it was not enough to effect a ship the size of the Mary Celeste. In the mates cabin the ships daily log was found. The last entry was dated November 25, 1872 at 8:00 am, nine days earlier. It recorded the Mary Celeste’s position just off Santa Maria Island in the Azoles, nearly 400 nautical miles from the point where the Dei Gratia encountered her. Deveau took note that the cabin interiors were wet and untidy from water which had entered through doorways and skylights, but otherwise in good order. In Brigg’s cabin, Deveau found personal items scattered about, including a sheathed sword under the bed, but most of the ship’s papers, together with the captains navigational instruments were missing. Galley equipment was neatly stowed away and there were ample provisions in the stores. Only the moldy remains of what looked like a child’s breakfast was found on the table. There were no signs of fire or violence. The evidence indicated an orderly departure from the ship by means of the missing lifeboat. After reporting these findings to Captain Morehouse, he agreed to transport the abandon ship to Gibraltar, 600 nautical miles away. Under maritime law a salvager could expect a substantial share of the combined value of the ship and the cargo. Captain Morehouse divided the Dei Gratia eight man crew between the two ships. The weather was fairly calm for the trip to Gibraltar but with each ship severally undermanned progress was slow. On December 12, 1872 the Dei Gratia reached Gibraltar. The Mary Celeste, having encountered fog arrived the following morning. She was immediately impounded by the vice admiralty court, preparatory to salvage hearings. The salvage court hearings began on December 17, 1872, under Sir James Cochrane, the chief justice of Gibraltar. The hearing was conducted by Fredrick Solly Flood, Attorney General of Gibraltar, who was also Advocate-General and Proctor for the Queen in Her Office of Admiralty. Somehow the testimonies of Oliver Deveau and John Wright convinced Attorney General Flood that foul play had been committed. He was quoted as saying “The inference is that Foul Play has been committed and that alcohol is at the bottom of it.” On December 23 Flood order an examination of the Mary Celeste, which was carried out by John Austin, Surveyor of Shipping, with the assistance of a diver, Ricardo Portunato. Austin noted cuts on each side of the bow, he thought caused by a sharp instrument, and found what he believed to be possible traces of blood on the captain’s sword. His report emphasized that the ship did not appear to have been struck by heavy weather. To support his claim he cited a phial of sewing machine oil found upright in its place. Austin did not acknowledge that the phial might have been replaced since the abandonment, nor did the court raise this point. Portunato’s report on the hull concluded that the ship had not been involved in a collision or run aground. A further inspection by a group of Royal Naval captains endorsed Austin’s opinion that the cuts on the bow had been caused deliberately. They also discovered stains on one of the ship’s rails that might have been blood, together with a deep mark possibly caused by an axe. These findings strengthened Flood’s suspicions’ that human wrongdoing rather that natural disaster lay behind the mystery of the abandon ship. On January 22, 1873, Flood sent the reports to the Board of Trade in London, adding his own conclusion that the crew had got at the alcohol (he ignored its non-potability) and murdered the Briggs family and the ship’s officers in a drunken frenzy. He stated they had cut the bows to simulate a collision, then fled in the yawl to suffer an unknown fate. Flood thought that Morehouse and his men were hiding something, specifically that the Mary Celeste had been abandon in a more easterly location and that the log had been doctored. He could not accept that the Mary Celeste could have traveled so far while unmanned. Oh Janurary 15, James Winchester arrived in Gibraltar, to inquire when the Mary Celeste might be released to deliver its cargo. Flood demanded a surety of $15,000, money Winchester did not have. He became aware that flood thought he might have deliberately engaged a crew that would kill Briggs and his officers, as part of some conspiracy. On January 29, during a series of sharp exchanges with Flood, Winchester testified to Brigg’s high character, and insisted that he would not have abandoned the ship except in extreme circumstances, Flood’s theories of mutiny and murder received a significant setback when scientific analysis of the stains found on the sword and elsewhere on the ship showed that they were not blood. A second blow to Flood followed in a report commissioned by Howard Sprauge, the American consul in Gibraltar, from Captain Shufeldt of the US Navy, In Shufeldt’s view the marks on the bow were not man-made, but came from the natural actions of the sea on the ships timbers. On February 25 with nothing to support his suspicions, Flood reluctantly released the Mary Celeste from the court’s jurisdiction. Two weeks later, with a locally raised crew headed by Captain George Blatchford from Massachusetts, the Mary Celeste left Gibraltar for Genoa. On April 8, the question of the salvage payment was decided when Cochrane announced the award of £1,700 or about one-fifth of the total value of ship and cargo. This was far lower than the general expectation. It was thought that payment should have been two to three times that amount given the level of hazard in bringing the abandon ship into port. Cochrane’s final words were harshly critical of Morehouse for his decision, earlier in the hearing, to the Dei Gratia under Deveau to deliver its cargo of petroleum. Morehouse had remained in Gibraltar at the disposal of the court. Cochrane’s tone carried an implication of wrongdoing which followed Morehouse and his crew for the rest of their lives. 135 years later a new investigation was conducted. With the use of modern investigative techniques and the finding of new evidence it has been determined the Mary Celeste and crew was not the victims of foul play. The Mary Celeste encountered three major storms and it had taken three weeks to sail what should have taken no more than two weeks. Captain Brigg made a major route change trying to avoid more storms. On November 22 with no land insight Briggs realized that his navigational equipment was faulty. On November 24 the Mary Celeste encountered more bad weather. Rain and winds of 30 knots and higher battered the ship. On the morning of November 25, 1872 it is believed that Captain Brigg’s was under the impression that the Mary Celeste was slowly sinking and he made the decision to abandon ship to save the lives of his family and crew. Seeing land that he believed to be the island of Santa Maria in the Azoles about 13 miles away and a break in the weather he ordered his family and crew to abandon ship. The Brigg’s family and crew, left all personal belongings behind and set sail in the small yawl for land. It is believed that bad weather and waves overtook the small lifeboat. They are not believed to have ever made it to land. There are Christmas trees and reindeer and candy canes, but Santa Claus is probably one of the most familiar images intertwined with Christmas. Most of us as kids were raised with the warning that you better be good, for goodness sake, or you would end up on Santa's naughty list and thus receive coal in your stocking. But as we trace back the various traditions associated with the holiday season, we come upon a character that has been around longer than good old St. Nick and the warnings that came with him, were far more dire. On this episode, we will explore the origins, history and terror that are a part of the legend of Krampus. During the 4th century AD, Roman influence caused many Germanic tribes, such as the Goths and Vandals, to convert to Christianity. Their pagan traditions managed to survive in small villages in the Alps where the Church couldn't penetrate. One of those pagan traditions involved Krampus. The name Krampus is derived from the German word "krampen" meaning “claw." 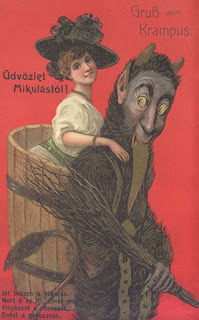 It is believed that Krampus started appearing sometime between the 11th and 13th centuries in Southern Germany and Austria (the area known as Bavaria) before spreading to Switzerland, Hungary, the Czech Republic and even the Alp villages of Italy under different names: Knecht Ruprecht, Certa, Black Peter, Schmutzli, Pelznickel and Klaubauf to name a few. The legend is said to have originated from a German folktale. There are some who claim that Krampus is a representation of the son of Hel, ruler of the underworld in Norse mythology. This is up for debate as most Norse mythology comes from the more Northern regions of the area while Krampus was a more southernly fixture. But it was in 1250 AD that King's Mirror, a Norwegian text, featured a Wild Man character who was described as being covered in hair. Having his roots in Germanic tradition, Krampus is the companion of St. Nicholas. He is no cutesy little elf; however, but a beast out of your worst nightmares. He is almost something like an evil twin to Santa. The difference to us would be as if you were comparing God to Satan. And the descriptions of Krampus are quite similar to the traditional ideas about Satan. Krampus rises to the height of seven feet and has long goat horns, cloven hooves, pointed ears, bulging eyes and is entirely covered with dark, matted hair. One of his most recognizable features is a huge pointed tongue protruding from between sharp fang that moves around whip-like. Not only is he terrifying to behold, but his actions make him the perfect horror movie star. While Santa might bring coal to bad kids, Krampus brings true punishment. He carries with him bells, birch stick switches, whips and rusty chains and uses them on naughty children before throwing them in his basket and dragging them to the underworld where they would serve him until they repented or even for their whole lives or even more frightening, he may even eat them. The bells he carries are rung to warn the children that he is coming. Quite different than the bell ringing in the movie "A Wonderful Life" where such a sound was equated with an angel getting his wings, not a child getting an extreme punishment. One can imagine that this would be quite persuasive in getting children to be on their very best behavior all year long. Some believe that the chains are carried by Krampus as a carry over from Christianity. As Christianity adopted pagan traditions and altered them to fit its customs, it is believed that Krampus became a representative of Satan and thus the chains symbolized Satan being bound to the Church. Krampus was given his own night, which is still observed today: Krampusnacht also referred to as Krampus Night, which is celebrated on December 5th. On this night, Krampus runs around making loud noises and scaring the children. It is customary to offer a drink of warm Schnapps to Krampus. This tradition has inspired Krampuslauf (Krampus Run) where intoxicated party goers dress as devils, wild-men and witches bearing torches and they run through the streets terrifying children and adults alike. The trend has caught on, spreading to other parts of Europe like France and Finland and even many American cities like Philadelphia, Portland, Rochester, Los Angeles and others. Some of these festivals can last for days. Another tradition has Krampus joining St. Nicholas on Christmas Eve, so that he could handle Santa's naughty list. 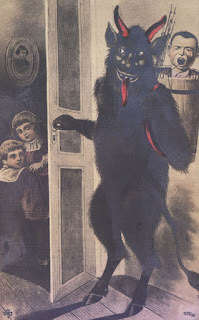 He did seem to fall by the wayside for a bit, but then Krampus started to regain acceptance and a following in the 19th century thanks in part to the Brothers Grimm. And Krampus got a quick reference in the 1835 book Deutsche Mythologie. In the early 19th century, Krampus began appearing on greeting cards and soon there was a Krampus card for every St. Nicholas card. These greeting cards depicted the creature in all his glory, a peculiar way to wish someone happy holidays. The Catholic Church has outlawed the observation of Krampus Night at various times in history. During the reign of the Third Reich, Krampus was outlawed as being a socialist but was allowed to invade the streets again when World War II came to an end. Yes, even the Nazis feared Krampus. Although St. Nicholas has been given the job of punishing naughty kids by either not bringing them presents or leaving them coal in their stockings, Krampus is making a comeback and has become commercialized. You can find him everywhere from t-shirts to comic books and even Hollywood horror movies, which is why we picked this day to release this episode since the Krampus Movie is debuting today. Krampus has been on American Dad, Supernatural, The Colbert Report and Grimm. When discussing a creature like Krampus, it is only fitting to discuss someone else who appears in the folklore of the Alp regions and is sometimes seen as a partner to krampus and that is Perchta. She is sometimes described as a goddess of light, but she has a dual nature and the other side is quite horrific and the one that is focused upon at Christmas time. Perchta was described as roaming the countryside in Bavaria during the winter. She would enter homes during the twelve days between Christmas and Epiphany and apparently she had been watching the children because she knew who had been good and who had been bad. Good kids got coins in their shoes, but woe to the bad kids because Perchta was worse than Krampus. She would just slit their bellies open then and there. She clean out their guts and stuff them with straw. I bet these kids ate their porridge after that tale! Many of the pictures we have seen of this female entity look very similar to Krampus. A match made in Hell perhaps? Mummery is also something that has ancient folklore ties and is a European practice that takes place during the Winter Solstice or the holiday season. Mummers are people who perform in disguises that represent creatures, animals, mythic figures and the like. One of those characters would be Krampus, so basically those that dress up on Krampus Night are mummers. Mummery is believed to be the inspiration for dressing up on Halloween. Newfoundland has a Mummer's Festival every year and it is believed that Newfoundland is where mummery got its start. The practice had all but died out in 1861 when a bill was passed making it illegal for people to wear masks in public without official permission from the government after a man named Isaac Mercer was killed by a bunch of mummers. Today it is experiencing a resurgence. Philadelphia hosts the Mummer's Parade every year to bring in the New Year. It started in the 1800s and was made official in 1900. The parade features music, pageantry and unique costumes. 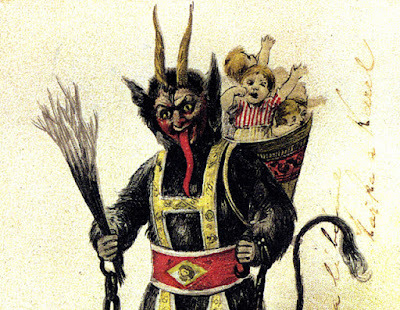 Is it the resurgence in pagan religions, hunger for a darker `Nightmare Before Christmas’ style holiday or possibly a world of increasingly dissatisfied and spoiled children that is the reason for the renewed interest in the “Christmas Demon?” Could Krampus be here to scare these spoiled kids straight? We know that St. Nick is based on a real person in history. Did a creature like Krampus ever exist? That is for you to decide!